Saint Paul RiverCentre is truly more than a convention center. 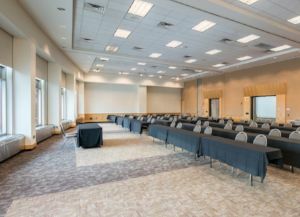 This event complex features two distinct, yet connected venues that can genuinely accommodate events of all types and sizes. IMPORTANT NOTE: Room capacities are fire code capacities. When planning your event, please note room capacity may decrease depending on AV production and/or catering requirements. For more details, please contact your event manager. For information on booking your event at Saint Paul RiverCentre, please contact our sales team. 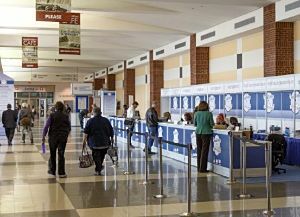 Exhibition Halls A & B are situated on the lower level of Saint Paul RiverCentre. Guests enter this space via a dramatic and award-winning terrazzo rotunda floor with soaring ceilings and natural light. Combined, the exhibition halls boast over 68,000 square feet of continuous exhibition space and are directly connected to a fully enclosed loading dock, making for easy load-in and load-out access for events. Exhibitor utilities (electrical, phone, internet, cable, air and water) are located in floor boxes throughout the entire floor, allowing for a clean and efficient exhibitor experience. For additional exhibit space, the exhibition halls are directly connected to the Roy Wilkins Exhibition Halls. This 27,000 square foot ballroom is one of the largest in the Twin Cities area. Groups of all sizes appreciate the ability to divide the space into eight individual sections, as well as soaring ceiling heights of 30 feet and neutral décor to suit events of all types. 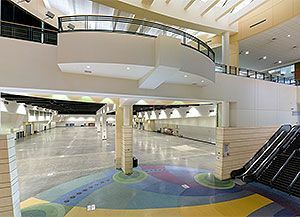 Fifteen meeting rooms are located on the upper level of Saint Paul RiverCentre. Meeting rooms 1 – 9 are equipped with floor to ceiling windows while meeting rooms 10 – 15 feature a more private arrangement, complete with concourse seating, charging stations and workspace. Rooms can be used individually or grouped in 2 or 3 to form larger meeting rooms. Located on street level, Kellogg Lobby provides a welcoming entrance for your guests and is suitable for registration areas, meal functions, and exhibition space. This luminous lobby features public glass art, a made-from-scratch café, and workstations for guests. The executive boardroom sits on Saint Paul RiverCentre’s 5th floor. 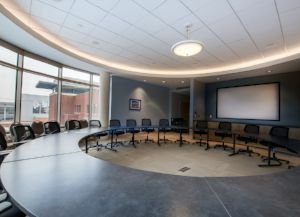 It overlooks Saint Paul’s beautiful Rice Park and features a built-in screen and projector, self tinting windows, boardroom style seating and executive chairs. 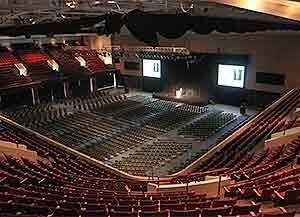 Named for the prominent civil rights activist, this 44,800 square foot auditorium services events of all types. Musicians such as the Grateful Dead, Dave Matthews Band, Bruno Mars and Imagine Dragons have all played shows in this space. 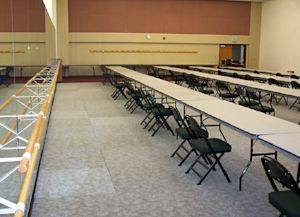 Additionally, space is well suited for general sessions, exhibits, sporting events and more. The auditorium can accommodate seating for over 5,500 and features a balcony level that can be concealed with a curtaining system. 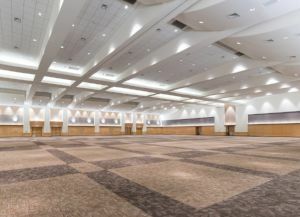 Situated below Roy Wilkins Auditorium and directly connected to Saint Paul RiverCentre’s Exhibition Halls A & B, this space features 30,000 square feet of exhibition space that services events of all types. Professional dance studio space for rehearsal, social, and competitive dance is located directly above Roy Wilkins Auditorium. Monday – Friday, this space is occupied by the Saint Paul Conservatory for Arts Dance School. On evenings and weekends, space is available for rent and features four 3,200 square foot dance studios, each equipped with a 40’ x 60’ dance floor, spring-loaded flooring, 18’ ceilings, rigging for silks and flying devices, and studio mirrors. This space is equipped with carpet and a curtaining system to conceal the mirrors and transform into non dance related event space.